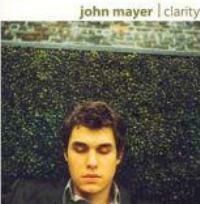 "Clarity" is a song by John Mayer, sparsely arranged with piano and drums provided, in part, by The Roots drummer Questlove. It was the second single from Mayer's 2003 album Heavier Things. The song's meaning is not immediately clear. Some interpretations have characterized the song as being about coming to terms with a relationship, while others have interpreted the song as being about a person's own self-perception. At his February 28, 2007, show at Madison Square Garden, John introduced "Clarity" as a song written about the first few seconds after waking up in the morning when you don't remember about all of the problems and worries in your life. At the "Soundstage with Buddy Guy" concert, Mayer explained the song as one of the best he's done, in that it's the best in portraying his thoughts and feelings. "Clarity" peaked at #13 on the Billboard Adult Top 40 chart and #25 on the Billboard Bubbling Under Hot 100 Singles chart. This song was covered by Najee in his album Rising Sun in 2007.